Professor Stoll has published papers in Journals in various fields of Medical Process Measurement, Lab Automation, Smart Systems and Devices, Instrumentation for Pharmacy and Practical Medicine as well as Artificial Intelligence Applications. He was active in national and international congresses on these topics. 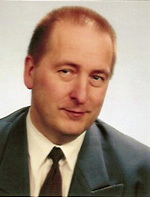 He received numerous research grants in process automation and measurement technologies. Beside the academics he founded different private ventures and technology transfer initiatives in Germany. Dr. Stoll has no relevant financial relationships to disclose.